I am on the plane returning from five days in our house in Corfu . 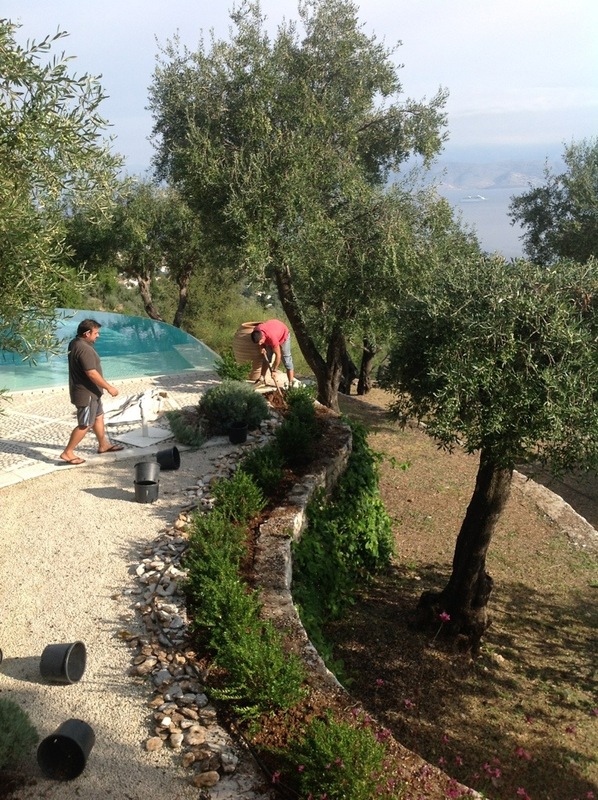 My sonThomas has been staying with me and with the help of Giannis and Byron, a very attractive Albanian who permanently has a cigarette hanging out of the corner of his mouth, we have been replanting the garden at Prosilio. They arrive at 9am with what seems a huge amount of plants, and then get to work with a pick axe and fairly medaeval looking gardening tools. Basically what we are doing is replacing the fairly sick looking lavender with myrtle, and hope that it will stand up to the intense heat of the summer better than the lavender. 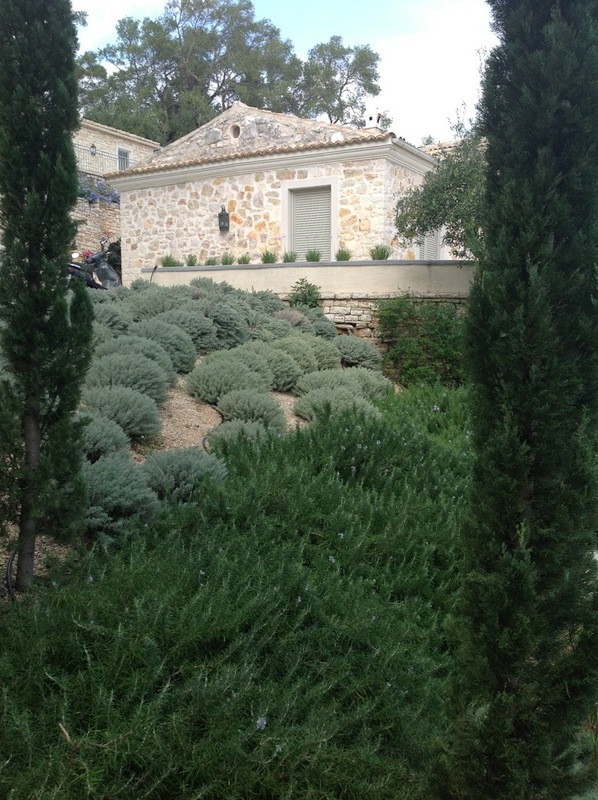 Outside our bedroom we have used a lot of westringia which has a blue grey leaf and is rather reminiscent of rosemary. It is very drought resistant and comes from Australia. My idea is that near the house we should have plants that are all different shades of green and blend into all the olive trees, so that everything is evergreen. Then on the two terraces we should have colour with the orange tecomaria capensis which is planted all along the front of the bottom terrace. To the left of them is 5 pomegranate bushes, and then 5 red and orange lantana. It took me a while to like lantana, but pruned properly it will flower all summer. These are all full of colour in October. Giannis is the master mind of everything, I could not do without his help and enthusiasm. I never would have thought I would be happy with a contract gardener, but I am. In the front of the house we have planted a cycas revoluta, which is a very ancient and slow growing palm. At the top of the steps and underneath the cottage we have planted 5 arbutus unedo, which are amongst my favourite shrubs, and are all fruiting in the wild outside Dominic and Thomas’ s, house. Their fruit is like gritty strawberries. The next step is to see if everything will come through a long, cold, and very wet winter. I would like to go back there to see our two cats and how everything is getting on, but I dont think James would come. I have completely gone off callistemon.